Are people knocking on your door instead of using the doorbell? If so, the button may be hard to find. It should always be located close to the door knob. If there are several dwelling units in one building you will need a doorbell button with room for a name. The button shown to the right is at a house with rental units on each floor. There are basically two systems, wired and wireless. 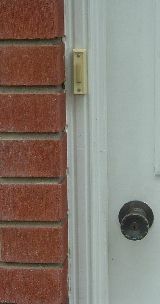 The push button to activate the doorbell, chimes or buzzer comes in a wide variety of styles and materials. Buttons can be highly decorative and some have a built-in light which comes in handy for evening visitors. In most wired systems, a button, located around the height of the doorknob, activates a signaling device (usually a chime, bell, or buzzer) inside the house. In a wired system power is supplied by a transformer, which is usually located in the basement's utility room. The transformer decreases the electrical power from 120-240 volt AC to low voltage, usually 10-20 volts. The transformer's other terminal connects to one of three terminals on the signaling device. Another terminal is connected to a wire that travels to the other terminal on the button. If there is another button (usually at the back door), it is connected between the transformer and the third terminal on the signaling device. For more info, see wiring diagram. It may not always be practical to repair or replace a wired doorbell system. If that is the case it is time to switch over to a wireless system. They are easy to install as there are no wires to run between button and transformer. A button near the door activates a built-in transmitter. The transmitter sends a radio signal to the doorbell radio receiver inside the building. When the radio signal is detected by the receiver, it activates the doorbell. There are also wireless doorbell systems where the receiver is portable and is effective for up to 100 feet (30 m) from the push button which means that you can work in the backyard and don't miss a caller at the front door. TIP. Look for a model that can be programmed with a different sound for each entrance and comes with an adjustable frequency code to prevent interference. Even better, some systems automatically eliminate interference, there is no need to adjust the frequency code.